"There is no abstract art. You must always start with something." Picasso fits into many streams of the 20th century. He was the most original and versatile artist of 20th century. Most artists hit a single market for success. For example, one of the "Other" artists we talk about is Iowa painter Grant Wood. Wood also created some great sculptures, but they continue to be less desirable to collectors and they have a more narrow market when compared to his paintings and other flat works. Picasso, however, was able to create, market, and sell a wide range of artworks. Everything from sculptures, to paintings, to ceramic plates, to engravings, and the list goes on and on. Did he do for the fame or money? "We can make it terribly difficult for ourselves and all of a sudden torture ourselves over painting without anyone making us. On the contrary, no one gives a damn whether you do one thing or another. [We do it because] at the moment you do it, it makes you feel better. And that’s what’s important." His drive to create caused him to produce around fifteen thousand paintings, over six hundred and fifty sculptures, and countless drawings, graphics, ceramic, and other design works. The work’s byproduct was popularity, success, and longevity as a professional artist. It has been said that more people knew the name Picasso when he was alive then ever knew Michelangelo Buonarroti, Rembrandt van Rijn, Leonardo da Vinci, Vincent van Gogh or anyother artist from the past while they were alive. For this reason, we must recognize his standing and contribution to the art world. He was the greatest artist of the twentieth century. No one automatically born with the title of being the best. Picasso was born into an art family in Málaga, Spain. His dad was an art teacher and Pablo would begin to create works by the age of eight. It is even claimed that Picasso's first word was "piz," based on the Spanish lápiz (pencil). Picasso’s dad got him in the good habit of making plans and sketches for his works at this early age. That was a habit he carried throughout his life. From these early years until the end of his life, he would paint until 2 or 3 in the morning on occasion and often put in eight hours of work a day in his studio. "When I was twelve I could draw like Raphael." By the age of fifteen, he was a successful exhibitor of his art. As his abilities were growing, so was his ego. People thought of him as a self-centered, bitter, and a young man that was overly critical of others artworks. He was fully trained as an artist, guided by his father, by the time he was about sixteen years old, but he did not care for school. He would spend his days at school drawing. He attended several art academies, but was not to into the formality of the schools. In Barcelona, Spain, Picasso begins to work in his first major phase. This would become known as his "Blue Period". This was a time that was on the edge of Post-Impressionism (1901-4). His color palette was dominated by the cool blues and purples. It was also a reflection of his mood. Off on his own he was having new experiences: being lonely; depressed about the death of his best friend; having little money, homesick; and he had a falling out with his father over the direction of his art. One of the great examples of the Blue Period is The Old Guitarist. The monochromatic work with a sorrowful theme. As mentioned, Pablo Picasso’s best friend had died (Carlos Casagemas had committed suicide), sending him into a deep depression. He created many works focusing on the sadness that comes with poverty, illness, and being an outcast. In The Old Guitarist, the blind old man with a slumped posture sadly strums his guitar. His clothes are torn rags and his only company is his music. Music is usually used as a device that brings people in, however, in this case, it is used to isolate this man. 1903-4. Oil on panel. 48 3/8 x 32 1/2 in. Art Institute of Chicago, Chicago Il. Picasso permanently moved to Paris, France in 1904. In the area known as Montmartre, he would begin to work in his "Rose Period" the following year. This was a visually more upbeat time for him. He paints subjects of love, the circus, and other happier topics. For the first time a romance would greatly affect his artwork. He fell in love with a young model named Fernande Olivier, however, because she was married, they could only have a short seven year fling. The romance in his life, as well as his experimentation with opium, caused him to regain a love for life. At this time he also became obsessive about placing the dates that he worked on and completed artworks on his work. This was a trend he continued throughout his career. "Why do you think I date everything I do? Because it is not sufficient to know an artist’s works- it is also necessary to know when he did them, why, how, under what circum stances… Someday there will undoubtedly be a science- it maybe called ‘the science of man’- which will seek to learn more about man in general through the study of the creative man. I often think about such a science, and I want to leave to posterity a documentation that will be as complete as possible. That’s why I put a date on everything I do." While still living in Paris, Picasso met artist colleague George Braque. The two became great friends and shared many of the same ideas about art. Both were greatly influenced by Paul Cézanne's paintings that seem to reduce reality into a patchwork of unique areas. From Cézanne’s starting point, the artists begin to developed the "Cubist" style. Although Cubism was largely Braque's idea, Picasso was not too proud to perfect it. As Picasso once stated, "If there's something to be stolen, I steal it." Although it was not likely the first, Picasso's Les Demoiselles d'Avignon (The Young Women of Avignon) was the first great Cubist artwork. Picasso saw Cézanne as an artistic father figure. They both shared their hatred for titling their works. Each in their own days would often ask others to title the works for them. Picasso hated the title Les Demoiselles d'Avignon. It was originally titled The Philosophical Brothel but the artworks name was changed in 1916. The works title came from Calle Avignon, a street in Barcelona where the brothel was located. The conception of this work took place in the year Cézanne died, 1906. It took him about a year to finish it. He took the palette of colors straight from Cézanne. He removes all signs of black and replaces them with various shades of blue and relies almost completely on the use of reds and blues. The faces within the painting were largely impacted by African masks and sculpture. Only a small group of patrons saw the finished painting, but no one wanted to buy it. Some thought he went crazy. So, for some time, the painting faced the wall in his studio until he decided to reveal it to the world, thirty years after it was finished. "Any form that conveys to us the sense of reality is the one furthest removed from the reality of the retina; the eyes of the artist are open to a superior reality; his works are evocations." 1907. Oil on canvas. 96 X 92 in. The Museum of Modern Art, NY. USA. Braque was the only artist to work with Picasso as his true equal. Their Cubistic style and approach is identical. Even the artists themselves often confuse their works. Picasso said, "What does it mean for a painter to…imitate another? What’s wrong with it? On the contrary it’s good. You have attempted to imitate another. The thing is, we can’t! We’d like to, we try, but the whole thing fails…and it’s at that moment when we fail that we are ourselves." George Braque never had the recognition that Picasso received. At the age of twelve, with is first savings, he bought an easel and a box of oil paints. He was hooked. As a young man, he joined the army but was soon following an art career. On his first attempt, he was allowed into the Salon des Independants. "I understood at that moment that I was a painter. Until then I didn't believe it." Working in the Fauvist style, like Henri Matisse, and was working to get into the Salon d' Automne. Matisse was on the jury and said "What cubes!" It stuck in the form of what would become Cubism. His art dealer, Daniel-Henry Kahnweiler, introduced him to Picasso. Picasso liked drinking and bar fights, while Braque liked bicycling around Paris. Although very different from one another, the became great friends and worked together from about 1906 until the beginning of World War I, in 1914. Braque reenlisted into the Army during World War I, but was injured on May 11, 1915 after being hit by a chunk of shrapnel. He went back to creating his art. Cubism evolved into a way of seeing reality simultaneously from all angels. There are two specific types of Cubism: Analytical and Synthetic. Analytical Cubism is the use of paint alone to achieve the product and Synthetic incorporates Braque’s original idea of collage. One day he bought a roll of wall paper that looked like oak wood grain. He drew a still life with grapes, cup, and bowl of fruit on a table. He cut the wall paper out to be glued on as a drawer in the table and as the bowl: collage was born. Picasso loved to claim Braque’s ideas as his own. Picasso was an internationally known artist by 1910. This allowed him the ability to shake things up a bit with his personal style. Picasso was always experimenting with styles. As Cubism was evolving, he was also experimenting with Dada and Surrealism, as well as varied other ways of creating sculpture and painting. He dabbled in Surrealism primarily in 1925 and 1937. He was not a Surrealist like Salvador Dalí, but more in the approach of Joan Miró. Picasso’s most known surrealist work was Guernica. 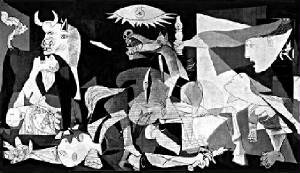 Guernica was Picasso's finest war protest work. But what is the story behind this great work? In July 1936, Civil War broke out in Spain. Gen. Francisco Franco’s Nationalists were opposed by the common people’s Republican Party. As Spain’s conflict of right against left escalated, the Nationalists sought support from Mussolini’s Fascist Italy and Hitler’s Nazi Germany. Republicans invited Stalin’s Communist Soviet Union for aid. Picasso would join the Communist Party in October of 1944. Franco wanted to save Spain from atheism and socialism, he'd have half the citizens killed; there battle cry was "Viva la muerte!" (Long live death!). It’s like the major players of World War II gathering for the pre-game show. But this was far from a game. During the civil war, a shell hit the Prado and Picasso felt personally attacked. As the Director of the Prado he developed an evacuation of the most teasured artworks to Valenca. The city of Gernika became something of a safe-haven for Republican supporters displaced by the conflict. This city had made a resilient stand against Franco’s dictatorship. Monday was marked day for the town. Peasants from all around would travel in to buy and sell their wears. Monday April 26, 1937 would be a historical first. At four o'clock in the afternoon, the unprotected city was the first city in history to be rocked with saturation bombings. Franco approved for Hitler to deploy his Luftwaffe to pound the town with fourty warplanes that waved in with high-explosive and incendiary bombs which destroyed the town in an event that lasted four hours. People that attemted to run into the fields were machine-gunned by the low flying planes. A quarter of the cities population was murdered on the spot, many more would die of the woundes as time passes. News of this event spread quickly. Picasso read about this in the Ce Soir in Paris on April 30. The politically outspoken Picasso refused to enter Spain under a dictatorship and would never returned to his homeland. He lived in occupied Paris through World War II, due to his Spanish citizenship and fame. Picasso was criticized for his communist affiliation and strong political beliefs. "What do you think an artist is? An idiot with nothing but eyes? No, painting wasn’t invented to decorate people’s houses. It is a weapon of attack and defense against the enemy." The Republic commissioned Picasso to create a painting for the Spaish Pavilion as a part of the 1937 World's Fair that was hosted in Paris, France. From start to its hanging in the Pavilion, Picasso had only worked twenty-four days. Early in 1937, he was working from his new studio in the attic of 7, rue des Grands-Augustins. The studio was said to be the setting for The Unknown Masterpiece, a short story written in 1837 by the famous French author, Honoré de Balzac about the great painter Frenhofer, who works on a masterpiece in this studio. Taking years of his creative energy to produce, it became more abstract at time passes and when revealed it is ridiculed as the work of a madman. Frenhofer destroys the work and dies. Picasso’s painting had a result that was far different than fiction. The idea evolved as he went, although he did stay somewhat true to his original design. The child like horse became twisted with injury. The child like horse became twisted with injury. This horse is based on the idea of Pegasus. This mythological symbol of the birth of art and poetry, who was born from the dead Gorgon Medusa. Pegasus inspired positive things, but art can also be inspired by disaster. The fallen warrior holds his broken sward, but behind his hand we see the new hope of the growing flower. A fight between Dora Marr and Marie Thérèse inspired Picasso to intensify the agony on the faces of some of the women. The woman with the raised hands is borrowed form the woman on the far left side of Peter Paul Ruben’s Horrors of War. As well as Rubens, this work also has a lot of similarities of Francisco de Goya’s 3rd of May, 1808. As he worked, it was too large to get the twelve foot high canvas in the studio, so it was painted at a slight angle. He used a ladder with brushes tied to poles to reach the high areas. Before unveiling the work to members of the Spanish Embassy and some close friends, he had glued some strips of red papers on the canvas. He asked some what they thought, and they hated it. Pieces were removed until none remained and the painting as we know it was presented. After its unveiling, the French, Germans, and Soviets all had reasons to dismiss the work. Although Picasso did not own the work, he did not want it out of the sight of Franco. So It went on tour. The painting then traveled Europe and found a home at the Museum of Modern Art in New York, where Picasso wanted it be be until Spain was free. Franco wanted it sezied by the US and returned for Picasso's non-payment of taxes, but it was not. It was shipped to the United States on the SS Normandie. Many French police officers and members of the Gestapo gave him a hard time for his political beliefs and his painting, so he handed out postcards with the painting’s image printed on them. On one occasion a German officer, who was an admirer and interrogator, received one of these postcards. He asked, "Did you do this?" With his typical quick wit, Picasso replied, "No, you did." After many years in New York, it was moved to Spain in 1981 as a part of the Prado. In 1992 it became a major work in the Museo Nacional Reina Sofía. I visited the museum in 2010 and Guernica was the high light for me. The emotion Picasso places in this work do not translate from a book. It is only truely understood by viewing the painting first hand. Art is such a powerful thing. An illustration to this: in 2003 the United States Secretary of State, Gen. Colin Powell was meeting with the United Nations security council about the war in Iraq. A reproduction of Guernica was behind them in the council room where they were holding a press conference. A large blue tarp with a UN logo was put up to act as a backdrop and cover the artwork. With one of the most powerful military forces in the world, a true super power, but still, they must respect the awesome power of art. Now that’s power! 1937. Oil on canvas. 138.2 X 307.9 in. Museo Nacional Centro de Arte Reina Sofia. Madrid, Spain. As a general rule, creativity was sparked in Picasso with a new woman in his life. It began with Frenande Olivier during his Blue Period days. She often modeled for him. She saw him as a workaholic, impulsive buyer, and a jealous lover. She was dumped for another girl and soon died of tuberculosis. In 1914, when designing various things for the ballet "Parade" he met Olga Kokhlova, a Russian ballerina. She was his first wife. Being very uptight, snobbish, and against his bohemian lifestyle; she was the wrong wife for Picasso. She was painted many times, one example being Seated Bather. Together they had a son, Paul, in 1921. But they both grew boring to Picasso. After they divorced, she had a nervous breakdown and stalked him for years. He had an affair with the tall, athletic, blonde Swiss girl: Marie-Theresa Walter. They met in front of a department store at the end of his marriage to Olga. She was a fifteen year-old model for him that evolved into a love affair. We can see her in works like The Dream. She had Picasso’s first daughter. During the pregnancy, he and Olga were only separated and the Prado’s artworks were under the threat of destruction by Franco during the Spanish Civil War. "It was the worst time of my life." The relationship cooled off, but she was still crushed by his death. She hung herself in her garage in 1977. Dora Maar was the next muse. She was a great photographer who was known for her intelligence, artistic ability, and being nervous and passive with Picasso. She was with Picasso for seven years. She was painted as the Weaping Woman. She took a series of photos that chronicled the process of painting Guernica. She died alone in her Paris apartment at the age of 89 on July 16, 1997. He met Francois Gilot in Paris. She was an art student taken by his fame. She was with him for ten years before leaving him. She wrote a book in 1964, Life with Picasso. Picasso’s last lover and his second wife was Jacqueline Roque. She was with him his last twenty years of life. She was everything for the ageing Picasso and gave up a lot to be with him and his violence. After his death, she shot herself, committing suicide. In 1973, Picasso died in southern France at the age of 91. At the time of his death, it was estimated that his estate was valued at about 800 million dollars. And though we see him as a great artist what does it really mean? "We talk about painting as if it were a contest. The winner is the one who can go the furthest. But what does that mean, the furthest?.. We’re talking about paint. What is the equitant of breaking the sound barrier in a painting? Does it mean, being van Gogh?"